Knowing about dreadlock care is the first step towards healthy great looking dreadlocks. Dreadlocks are a simple hairstyle but they also require some work too. Listed below are some of the key factors that are the difference between so-so dreadlocks and great looking dreadlocks. Did you know that washing your dreadlocks is key for them to lock up completely? That’s right, clean dreadlocks lock faster. When your dreadlocks are new you will usually wash them once or twice a week. Once your dreadlocks have started to form and lock you can increase your washing to two or 3 times a week. Once the body of your dreads has locked up you should be washing at least 3 times a week. When you have dreadlocks you need to use a shampoo that doesn’t leave residues behind. Residues build up inside your dread and slow down the locking and loosen dreadlocks. To learn more about residues click here. You can learn about the different dreadlocks shampoos here. Twisting is one of the most popular and versatile ways to get hair to lock. You can use twisting on the roots, body and tips of your dreadlocks. You can twist your dreads to lock them up and you can twist loose hair to lock it into the dreadlock. Want nice smooth dreadlocks? Of course, everyone does. Palm rolling is how people get them. Palm rolling is rolling your dreadlock between the palms of your hands. Kind of like rolling play dough into a snake when you were a kid. For a video demonstration of palm rolling visit this page. Ever wondered how people get their dreadlocks to lock up at the root? Clockwise rubbing is the answer. To clockwise rub just hold your dread in between your fingers and rub the root of the dread against your scalp in a clockwise motion. Easy….. Simple……. Effective. For a video demonstration of clockwise rubbing visit this page. 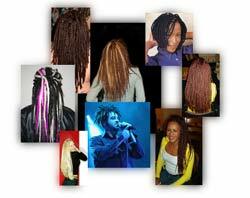 They are a part of dreadlocks maintenance and everyone has them from time to time. There are a few different techniques to getting rid of loose hairs. Twisting and Dread Balling – Basically you just twist the loose hair around and in circles until it locks, then push it into the dread. This can be a little difficult sometimes, so you can use a dental flosser or a loose hair tool to get the job done right. Dental Flosser – You can pick them up at local drug stores in the dental section. They are very handy for threading loose hairs through newly formed dreadlocks, but they can be a pain in locked up dreadlocks because they are not strong enough to penetrate the dreadlock. Loose Hair Tool – A very helpful tool when dealing with loose hairs in dreadlocks. This tool can help you pull plain straight hair through any part of your dreadlock. It can also help pull dread balls into your roots with little effort. Yes, it just sound gross, and it is. Leaving residues in your dreadlocks can do a lot more than loosen them, it can prevent hair from locking, hold water, and cause them to smell icky. So what is residue? Residues are anything left behind in your dreadlocks. Residues can cause itchy scalp and dandruff as well as irritations. They can trap dust, dirt, water, and mildew inside dreadlocks. Why is it important to use a residue free shampoo when you have dreadlocks? When you have dreadlocks the hair is packed tightly together so it’s very easy for stuff to get trapped in the middle of them and very hard to get it out. They can trap dust, dirt, water, and mildew inside dreadlocks, which can slow down the dreading process and just make your hair nasty. Do not be fooled by products that claim they are “all-natural”. Many of these products leave residues behind. Residues, natural or not, are bad for dreadlocks. If they are allowed to build up they can cause irritation and slow the dreading process just like any other residue. Where can I find residue free shampoos?